The LeveLine collects water level data at user-defined intervals and stores the information in its internal memory. The logger can take up to an impressive 10 readings per second and the huge internal memory is capable of storing up to 500,000 readings. Made from titanium the LeveLine is built for deployment in all kinds of water from fresh groundwater to salty marine waters. It is constructed with harsh environments in mind and has an ultra rugged titanium body and connectors that are highly resistant to corrosion. The Delrin nose cone reduces fouling of the pressure sensor, which extends the length of deployment, maintains data accuracy and extends the life of the LeveLine. Aquaread’s LeveLine is available with both vented (gauge) and non-vented (absolute) Kevlar reinforced cables that allow for real-time monitoring. If you choose the non-vented version we also manufacture a barometric pressure monitor, LeveLine – BARO. This unit is to be placed out of the water, in the vicinity of the water level logger. Each baro logger provides compensation data for multiple water level loggers that are close by. You can even select the desired testing depth range to ensure the best resolution at your chosen monitoring site. You can hook the LeveLine directly to a telemetry device because it outputs in SDI-12 as standard but if you opt for a more hands on approach you can monitor in real time using your laptop or the GPS LeveLine meter. The battery in each LeveLine can last for 10 years, which combined with the low maintenance requirements means that the LeveLine is ideal for deployment over a number of years. Combine the LeveLine with small ‘in-well’ telemetry system soon to be available and you have a powerful yet discrete monitoring system. 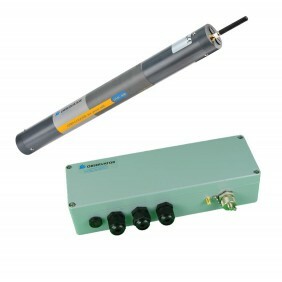 The LeveLine has multiple applications including: aquifer characterisation; watershed, drainage basin and recharge monitoring; harbor and tidal fluctuation monitoring; and industrial uses. The LeveLine water level logger provides highly accurate water level monitoring and can document baseline and changing water levels over time. The LeveLine is Modbus (RS485) and SDI-12 compatible, so no adaptors are necessary and it allows direct connection to telemetry and SCADA systems. The external 6-30V power supply input is compatible with batteries and solar power. Our water level logging equipment comes with intuitive PC software suite that allows simple set up and data retrieval. The LeveLine is the only water level logger to use the QuickDeploy Key or the GPS LeveLine Meter see how they can make your deployment simpler.